You’ve probably noticed I’m not the girliest of girls. I can do the winged eyeliner and red lips and pretend to adult, but I am most comfortable in skinny jeans, converse and an oversized jumper. Since I started blogging (nearly two years ago now, say whaat?) I’ve definitely got more into the beauty scene; my friend at work is always like oooh that looks shiny put it on me please and it makes me realise that, although I spend most of my days with blah hair and no makeup, I do enjoy being dressed up and looking nice; it’s just not necessarily in my comfort zone (read: I feel like a five year old in her mum’s heels). I always envy people who look glam 24/7, so rather than being a sour puss I’m trying to actually put a bit more effort in my appearance. Because yes, all the quotes are like she’s sexiest in her sweats, hair up and no makeup but if you can’t dress up and make an effort when your 23, when can you? Now, I have to point out that even dressing up for me is, err, dressed down. Grungy, oversized or boho still tend to make the final cut, just with a girly flirty edge. I was sent this outfit by Boohoo as part of their 70s Vibe Campaign and it’s one that I really like, although the weather isn’t the most permitting for it right now. 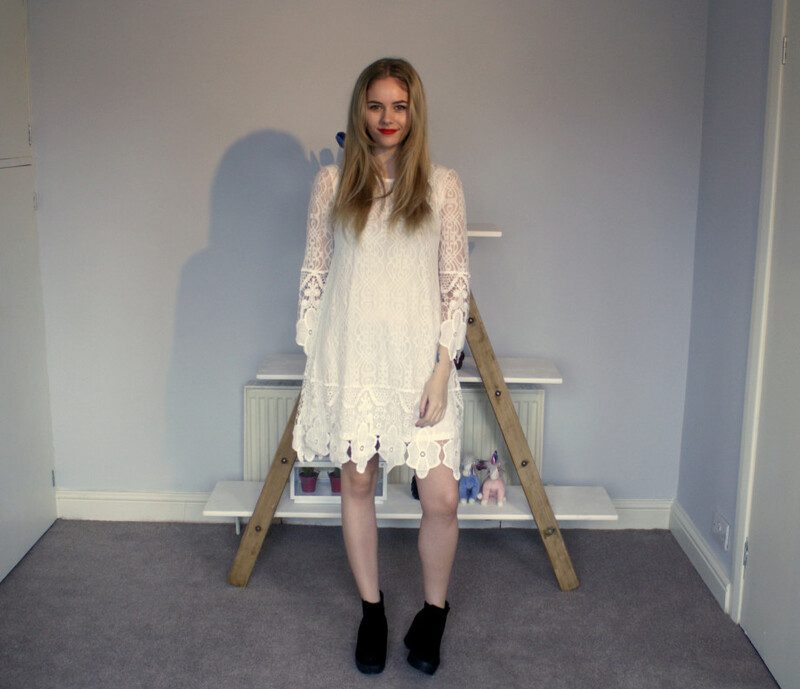 The dress is all white and lace but oversized to stop it from being too feminine, and the boots have quickly stole a place in my heart as my favourite shoes. They go perfectly with jeans and are a good heel for walking around exploring cities all day. Paired with the right dress, they definitely transition to night shoes – and ones which won’t leave you crippled the next day. I’d 100% buy these again as I’ve got so much wear out of them already! What do you wear when you want to feel a bit more glam?